Located on the slopes of the Trinity Mountains west of Weaverville, the La Grange hydraulic gold mine began operations around 1862 and continued until 1918 in a region that became a center of hydraulic mining. 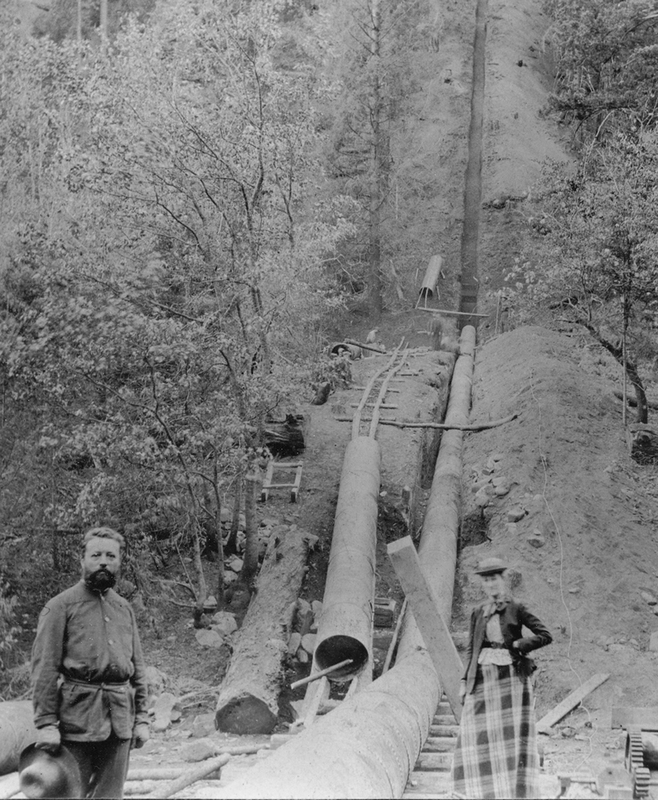 Hydraulic mining required vast amounts of water, so a group of miners formed the Weaverville Ditch and Hydraulic Mining Company for that purpose. The company was purchased by Baron Ernest de La Grange in 1892 for $250,000. From 1893 to 1915, the La Grange mine was the largest hydraulic mine in California and one of the largest mines in the world. More than 100 million yards of gravel was processed to produce $3.5 million worth of gold. From 1932 until 1942, further excavation at the mine for the state highway brought some gold production. The total output of the mine has been estimated to be at least $8 million, although the commemorative plaque states that it is $3.5 million. More than 100 million cubic yards of material was excavated. Water was delivered from Stuart’s Fork of the Trinity River via a 29-mile system of canals, flumes, siphons and tunnels. During the 1930s several other hydraulic mines and a considerable number of dragline dredges were active in the district. In 1918, at the close of World War I, the high cost of labor, steel and explosives to blow up hillsides forced closure of the mine. Much of the mine’s equipment was sold for scrap. Today, all that’s left of the mine are scarred hillsides and tailings ranging from 40 to 120 feet deep. Baron and Baroness de La Grange inspecting the construction of one of the siphons on the La Grange Ditch.